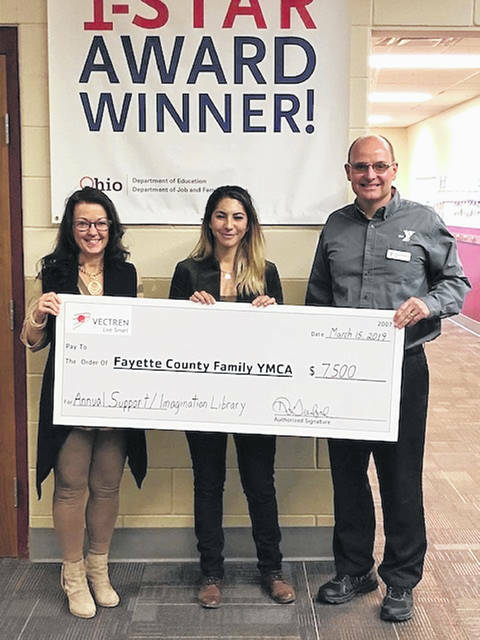 The Vectren Foundation recently donated to the Fayette County Family YMCA and United Way to support YMCA Child Care programs and the Dolly Parton Imagination library program. Pictured (L to R): United Way of Fayette County President Debbie Bryant, Community Relations Manager with Vectren Rachel Goodspeed and Fayette County Family YMCA CEO Doug Saunders. Rachel Goodspeed, community relations manager with Vectren — a CenterPoint Energy Company — recently presented a check to Fayette County Family YMCA CEO Doug Saunders and United Way of Fayette County President Debbie Bryant. This grant will support the infant through school age child care programs of the YMCA and enable kids through age 5 to participate in the Dolly Parton Imagination Library program for which the United Way of Fayette County is serving as the program Champion. “The Vectren Foundation is proud to support the YMCA and United Way in their efforts to promote literacy by giving all Fayette County children access to books, preparing them for kindergarten and lifelong learning,” Goodspeed said. Dolly Parton’s Imagination Library is a book gifting program that mails free books to children from birth to age 5 in participating communities within the United States, United Kingdom, Canada, Australia and Republic of Ireland. Inspired by her father’s inability to read and write, Dolly started her Imagination Library in 1995 for the children within her home county. Today, her program spans four countries and mails over one million free books each month to children around the world. The YMCA has offered infant through school age programs in Fayette County since 2000. In collaboration with Sugar Creek Packing, the YMCA offers Step Up To Quality rated programs for infant through pre-K at the child care located on Kenskill Avenue. The YMCA also offers Step To Quality rated before and after school and summer day camp for school age children at the YMCA. The YMCA serves over 400 children each year in these programs. The United Way is partnering to bring the program to other agencies as well. They are seeking funding to do so. For further information on YMCA child care programs, contact the YMCA at 740-335-0477 or visit their website at faycoymca.org. https://www.recordherald.com/wp-content/uploads/sites/27/2019/04/web1_Vectren-Check-Presentation.jpgThe Vectren Foundation recently donated to the Fayette County Family YMCA and United Way to support YMCA Child Care programs and the Dolly Parton Imagination library program. Pictured (L to R): United Way of Fayette County President Debbie Bryant, Community Relations Manager with Vectren Rachel Goodspeed and Fayette County Family YMCA CEO Doug Saunders.